Any talk of goal setting for the Christian must begin with an acknowledgment that God is in control. If we don’t think He can overrule our plans and goals, we are fooling ourselves. Does that mean we don’t plan and don’t set goals? No. An excellent Biblical example of this principle is David. He planned to build a temple for the Lord, but God directed His steps to just collect materials, have blueprints drawn up, and get everything ready for his son Solomon to build the temple. There is no indication in Scripture that God was displeased with the fact that David wanted to plan – only that his plans were not God’s plans. So it is with our goals. If they are not God’s goals for us, then they are meaningless. Therefore, as with everything we do, as believers we approach planning and goal-setting prayerfully. Pray first, pray during, and pray after your goal-setting sessions. But after your prayer time – where do you begin? I suggest that you begin by looking backward. Over the next 4 to 6 weeks, I will be revisiting the topic of goal-setting a few times. That is because it is important to me, I believe it is important to the Lord, and therefore, I think it may be important to you as well. And, of course, because we are quickly approaching a new year when goal-setting is at the top of many minds. However, to start with, we aren’t even going to think about moving forward. Instead, take stock of what you have accomplished in 2018. For me, it hasn’t been as successful and productive as I hoped in many areas. But there are areas of achievement. To make this exercise worthwhile, you will need to look at both the successes and failures of the past 12 months. Start by asking yourself some pointed questions – and be brutally honest with yourself. If you’re married and have a good relationship with your spouse, this might be a good exercise to do together. When the children of Israel crossed the Jordan River into the Promised Land, under Joshua’s leadership, they built a memorial altar. The stones were taken from the middle of the river – one for each of the 12 tribes – and set up on the bank of the river (Joshua 3). The purpose was so that the people could ‘look back’ at reminders of what God had done in the past as a source of encouragement for what He would do in the future. Going on to conquer the land, the Israelites looked back at their victory at Jericho to encourage themselves. But if you remember the story, they got overconfident and then suffered a costly defeat. When we look back at what God has done in our lives, we need to be sure we continue to keep the focus on Him, for without Him we can do nothing (John 15:5). A New Testament example of ‘looking back’ is Paul, who regularly took stock of where the churches he established were in their faith. He visited them again, wrote letters to them, and sent messengers to them. 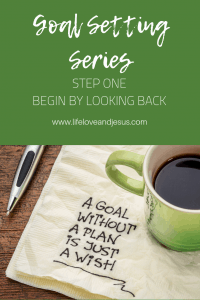 He looked back to see where they had come from, but then encouraged them to look forward to where they were going (1 Corinthians 6: 9-11; Philippians 3:13-15). What was my biggest accomplishment in the past 12 months? Why did that accomplishment succeed? What did I do differently to have success? Why was that accomplishment important to me? What are some favorite memories? What makes those memories special? What was time well spent? What was time wasted? What was money well spent? What was money wasted? What progress did I make towards big goals? How have my relationships improved during the last 12 months? Why was that challenge so difficult to overcome? What can I change going forward to be successful in this area? What unmet goals do I have? Do those goals need to be revisited or discarded? Who or what held me back? How did I hold myself back this year? What do I wish I could go back and change? What were my worst habits this year? How can I work towards changing them going forward? What were the three biggest lessons I learned this last year? What was the biggest risk I took this year? Did it pay off or flop? Who are the people I spent the most time with this year, and how did they influence me to succeed or fail in my goals? Is my life out a balance? Where? How? If you chose a word for the year, how did your year measure up to your word? If you chose a verse for the year, how did your year measure up to your verse? This list is not exhaustive, but it does cover a lot of ground – both the good and the bad. It is a good place to start before moving on to consider where you go in 2019. Looking back is a good first step in goal-setting. Use some time this week to evaluate your satisfaction with your life (see this post), and to consider the year that is quickly ending. To help you with this task, I’ve created a question list you can print and placed it in the Resource Library. I hope you find it helpful. 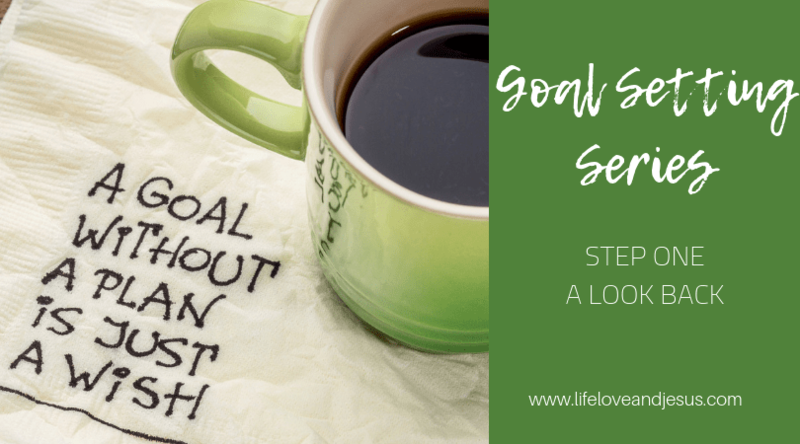 Be looking for more to come on this goal-setting series!